Sen. Joe Lieberman: Cartels represent a "clear and present" danger to U.S.
WASHINGTON (CNN) -- The Obama administration's initiative to deploy additional federal resources in the fight against rising drug-related violence along the Mexican border was criticized as insufficient in a Senate committee hearing Wednesday. Sens. 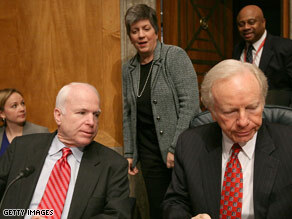 John McCain, left, and Joe Lieberman attend a committee hearing on Mexico border violence. The administration's plan to send hundreds of extra federal agents and new crime-fighting equipment to the border "represents a significant step forward" but is not enough, Sen. Joe Lieberman, I-Connecticut, said. Mexican drug cartels, believed to be operating in more than 230 American cities "from Appalachia to Alaska," represent a "clear and present" danger to the United States, Lieberman said at a Senate Homeland Security Committee hearing on border violence. "I think you're going to need more resources to get this job done," he told Homeland Security Secretary Janet Napolitano. The United States needs to "make life miserable" for the drug cartels so "life is better for us," he said. Committee member Sen. John McCain, R-Arizona, also praised the Obama administration's plan, but agreed more needs to be done. Lieberman, who chairs the committee, called for an additional $250 million to be used for the hiring of 1,600 additional customs and border protection officers. He said that another $50 million should be allocated to immigration and customs agents investigating firearms distribution and violence near the border. He also called on Congress to close "the gun show loophole ... that allows purchasers to circumvent background checks that occur at gun stores." Finally, he argued that U.S. laws need to be updated to help authorities better track money from American drug sales, "the lifeblood" of the cartels. Drug sale proceeds, he noted, are "increasingly being smuggled back to Mexico in stored-value cards. A single card can hold thousands of dollars, is far less conspicuous than bundled cash and does not have to be, as a matter of law, declared at the border," he said. The cards are "not considered legal monetary instruments," he noted, and officials therefore have little authority to police them. Lieberman said additional funds and legal reforms are necessary to combat cartel violence that has started to resemble tactics used by extremists in the war on terror. The cartels are "attacking police stations and other government facilities (and) kidnapping and killing family members or associates," he said. The Obama plan calls for doubling the number of border security task force teams, as well as moving a significant number of other federal agents, equipment and resources to the border. It also involves greater intelligence sharing aimed at cracking down on the flow into Mexico of money and weapons that help fuel the drug trade. The plan commits $700 million to bolster Mexican law-enforcement and crime-prevention efforts. It also calls for tripling the number of Department of Homeland Security intelligence analysts dedicated to stopping Mexican-related violence. In addition, it calls for increasing the number of U.S. immigration officials working in Mexico, strengthening the presence of border canine units and quadrupling the number of border liaison officers working with Mexican law enforcement agencies. McCain voiced praise in Wednesday's hearing for Mexican President Felipe Calderon's efforts to combat the cartels. He said Calderon is facing an uphill struggle in part because "corruption penetrates to literally the highest levels of (the Mexican) government." The drug war "is an existential threat to the government of Mexico," McCain said. "If the Mexican government fails and is taken over by the drug cartels ... it not only has profound consequences for Mexico, it certainly has the most profound consequences for the United States of America." McCain noted that the city of Phoenix, Arizona, now has the second-highest kidnapping rate in the world, behind only Mexico City. A recent rise in the number of kidnappings in Phoenix has been tied to the drug cartels. On Tuesday, Phoenix Mayor Phil Gordon called the administration's initiative "a great first step," but added, "it's a drop in the bucket in terms of what is needed." Phoenix finds itself at the center of a "perfect storm" of drug runners and human smugglers, he said. While most traditional crimes are down, crimes such as drug-related kidnappings and torturing are overwhelming Gordon's police department. "Most nights we have over 60 Phoenix police officers (and) some federal agents rushing to rescue those on a reactive basis," Gordon said. Texas Gov. Rick Perry also issued a mixed response on Tuesday to the administration's announcement. "While we appreciate the additional investigative resources, what we really need are more border patrol agents and officers at the bridges to conduct increased northbound and southbound inspections, as well as additional funding for local law enforcement along the border to deny Mexican drug cartels access to the United States," he said in a statement. "I have asked the administration for an immediate deployment of 1,000 additional National Guard troops to support civilian law enforcement and border patrol agents and remain hopeful that we will get the resources we need. The state of Texas will continue to fill in the gaps until the federal government provides adequate resources necessary to secure our border and protect our citizens from those seeking to do us harm." Clinton said the United States takes responsibility for its role in the drug wars and is committed to working with Mexico and helping it come out of the drug war stronger. "Our insatiable demand for illegal drugs fuels the drug trade," she said en route to Mexico City, Mexico, according to pool reports. "Our inability to prevent weapons from being illegally smuggled across the border to arm these criminals causes the deaths of police officers, soldiers and civilians. So, yes, I feel very strongly we have a co-responsibility."